Is it something you’re born with, or something that you can practice? After my experience with writing this blog, making videos, and taking pictures, I’m led to believe in the latter. I recently read brand consultant, copywriter, and cartoonist, Hugh MacLeod’s manifesto, How to Be Creative. In it, he talks about society’s effect of hampering creativity and how we can reclaim the mindset we’ve buried within ourselves to start doing what makes us feel alive. Everyone is born creative; everyone is given a box of crayons in kindergarten. Then when you hit puberty they take the crayons away and replace them with books on algebra etc. I’ve recently come to the realization of what our formal education system really does here in America. Going through public schooling from age 6-18, I never really felt like I was inspired to learn anything from my teachers. I appreciate the exposure to reading and math materials, but the learning still felt wrong. In the real world, when you’re learning something, you’re bound to fail when first practicing it, but when you fail in school, it is recorded and you are judged relentlessly for it. You’re not allowed to make even one mistake without it affecting the rest of your high school record. This fear of failure is built into the way our schools run and this mindset carries on throughout our young lives. 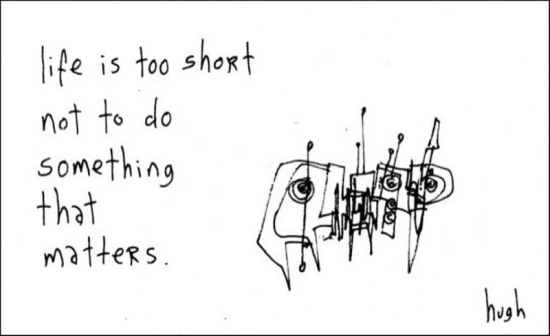 Life’s too short to be doing things we don’t want to do. Although you should have a somewhat steady way to bring in cash, do use your extra time outside of work to figure out what things you want to create. These things don’t even have to change the world. They just need to be completely you. We each have our own Mount Everest to climb, so don’t be afraid to take that first step. There’s never a right time, so just start. The more you practice your craft, the less you confuse worldly rewards with spiritual rewards, and vice versa. Even if your path never makes any money or furthers your career, thatʼs still worth a TON. The simple act of doing is what brings fulfillment. It may not bring in the material goods you want, but expressing yourself will bring you mental satisfaction and give you the chance everyday to build something amazing. When you expose your creative thoughts, you also have the possibility of connecting with people you never thought you would connect with. As human beings, we all hide our true emotions and opinions deep inside, but by being creative and expressing ourselves, it allows people to get a brief glimpse into our minds and share that experience. Whether it’s playing your own music, writing blogs, or creating videos or scarves, being creative is what builds human connection and enables us to live life fully.